SAN ANTONIO -- Three weeks after hitting a low point with a "pathetic" performance on Broadway, the Spurs hit a high note against the New York Knicks. LaMarcus Aldridge had 18 points and 11 rebounds, and San Antonio beat the Knicks 109-83 on Friday night to extend its season-best winning streak to seven games. "It's more of a focus and them understanding that when we play good defense, we're a darn good team," Spurs coach Gregg Popovich said. DeMar DeRozan and Bryn Forbes each added 13 points for the Spurs, whose previous season high was five straight victories. New York, which was without injured point guard Dennis Smith Jr., lost its eighth straight. Damyean Dotson had 21 points and DeAndre Jordan added 11 points, 13 rebounds and matched a career high with nine assists. The Spurs hold the league's longest active winning streak and have won nine straight and 16 of 18 at the AT&T Center. "It just feels good," San Antonio forward Rudy Gay said. "Things are clicking. Playing defense. Even when the ball is not going in like we want it to, we're still getting wins, and that's how you know we're getting better as a team." Gay had 12 points in 19 minutes after missing two games and losing 10 pounds because of the flu. The Spurs dominated defensively, which was in stark contrast to what Popovich deemed a "pathetic performance defensively" in their previous meeting with the Knicks. New York snapped an 18-game skid at home, routing the Spurs 130-118 on Feb. 24 as part of San Antonio's worst Rodeo Road Trip ever. The Spurs have had a greater sense of urgency since going 1-7 on that road trip and it continued against the team with the league's worst record (13-66). New York had 16 turnovers and shot 41 percent from the field. "When we beat them at our place, we limited our mistakes, our turnovers and stuff like that," Knicks forward Kevin Knox said. "So, they came in with a little bit of a chip and we just didn't respond." San Antonio opened an 11-point lead in the first quarter Friday and maintained that double-digit advantage for much of the game. The Spurs had 48 points in the paint behind the starting tandem of Aldridge and Jakob Poeltl. Aldridge had 10 points and seven rebounds and closed with his 25th double-double of the season. "(Having Poeltl start at center) kind of frees me up to float a little bit and kind of find my shot in different ways," Aldridge said. "I'm spacing the floor a little bit more. I'm not the focal point as the pick-and-roll guy all the time, so it kind of changes it up for me. He's been active." Poeltl had 12 points, nine rebounds and matched a career high with five blocks. Trailing 76-67, New York had an opportunity to pull closer but Kadeem Allen missed a contested layup as Aldridge raced back on defense following a turnover. Gay followed with a 3-pointer to extend the Spurs' lead to 79-67. "We just had too many guys making too many mistakes and you can't play with holes in the dam when the Spurs have you going like that," New York coach David Fizdale said. Knicks: Smith missed the game with a sore lower back. Fizdale said the team is unsure how the injury occurred, but Smith is day-to-day. "His back just kind of went out on him," Fizdale said. "He had a couple of collisions there during the last game (Tuesday against Indiana)." ... New York is 7-30 away from home, which is one more road win than Cleveland, Phoenix and Dallas. . Mitchell Robinson blocked two shots, extending his streak of consecutive games with a block to 26. Among Knicks rookies, only Patrick Ewing's 28 straight games with a block is longer in franchise history. ... The Knicks' previous win in San Antonio was Jan. 2, 2014, behind a double-double from Carmelo Anthony. . Forward Noah Vonleh did not return after injuring his right ankle in the first half. Fizdale said Vonleh will undergo an X-ray when the team returns to New York. Spurs: San Antonio is 24-1 at home this season when leading after the third quarter. The Spurs led 82-69 entering the fourth. ... DeRozan has 1,380 points this season, surpassing Dale Ellis (1,366) for third-highest total among non-rookies in their first season with the Spurs. Terry Cummings sits atop the list with 1,818 points followed by Artis Gilmore's 1,479. ... Forbes has 143 3-pointers this season after going 3 for 5 against the Knicks. He has the most 3-pointers in a season of any undrafted player in Spurs history. With bats buzzing the court at the AT&T Center recently during Spurs games, Fizdale was asked before the game what he would do if he saw one. "I like animals, I'm an animal lover," Fizdale said. "Hopefully we can catch it and let it go where it needs to go." The Spurs' mascot, The Coyote, has emerged in three games in a Batman costume attempting to corral the winged mammals with a hand-held net. The Coyote successfully captured a bat on Feb. 2 during the team's game against New Orleans. Fizdale said he would want a net, too, if a bat emerged. "Yeah, I mean we don't want to hurt it," Fizdale said. "It's just a little bat. Our guys will probably freak out." Fortunately for the Knicks, no bats were sighted. Knicks: Host L.A. Lakers on Sunday night. Spurs: Host Portland on Saturday night. 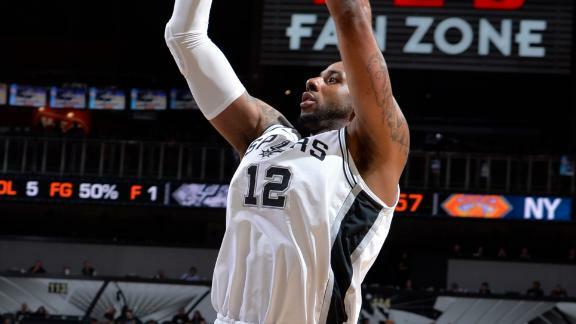 Lamarcus Aldridge records 18 points and 11 rebounds in the Spurs 109-83 win vs. the Knicks.